Latest Update on Ever-Changing Plans to Build a Bali Toll Way to Overcome Traffic Congestion. (1/19/2011) The ever-changing scenario to build new highways in Bali to overcome traffic congestion has entered yet another chapter. DenPost and Bali Post report that plans to build a toll road from Serangan island to Tanjung Benoa are being put aside in favor of an overpass constructed atop environmentally sensitive mangrove forests connecting south Denpasar (Pedungan) and Nusa Dua. A Bali provincial spokesperson confirmed this to the press on Wednesday, January 12, 2011, reporting that the central government has approved the new plan after considering all the alternatives, including toll ways, undersea tunnels and flyovers. In the end, a decision has been made to provide support for a 11.5 kilometer elevated highway constructed over the mangrove forests in Bali's south. Endeavoring to minimize the impact of the new road on the environmentally critical mangrove forest, the highways will be suspended on 1,000 supporting columns with an access point included near the airport access road. The new highway will also be designed to accommodate motorcycles as well as cars and trucks. To fast-track the program the government will immediately embark on a two-month survey prior to granting work contracts to build the road which, by presidential instruction, must be completed in time for a major APEC conference set for Bali in 2013. A toll road, the project will be financed and managed by four State-owned enterprises: PT Jasa Marga, PT Pelindo III, PT Angkasa Pura and the Bali Tourism Development Corporation (BTDC). Separately, the vice-chairman of the Bali House of Representatives (DPRD-Bali), Ketut Suwandhi, told the press that earlier plans to build a toll-way and bridge connecting Serangan Island (Turtle Island) with Tanjung Benoa have been prevented from moving ahead due to uncertain land titles on Serangan island, complicated further by the reported bankruptcy of the Turtle Island Development Corporation (BTID). Concerns were also raised that a toll road incorporating a bridge connecting Serangan island and Tanjung Benoa would interfere with shipping access to the port of Benoa and approach-departure paths for aircraft using the Bali Ngurah Rai Airport. Suwandhi said he hoped the new proposal to build a highway suspended over Bali's mangrove forests would not endanger the natural environment. At the same time, he acknowledged that some damage to the mangrove is inevitable and must result from the construction process of the new highway and that development plans must include a provision for reforestation after the road is built. 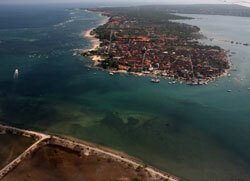 According to NusaBali the preliminary cost of the new suspended highway is put at Rp. 1.4 trillion or US$155 million. Meanwhile, a report in NusaBali makes a new addition to the Bali lexicon. While the name for the originally proposed toll-way bridge project is locally referred to as "Jembatan Serangan Tanjung Benoa" or "STB" the name now given to the suspended highway over the mangrove forest is "Jalan di Atas Rawa" or "JDR."